Some animals are known for their size, their speed or their ability to fly great distances … But the macá tobiano has the 'pride' nothing more and nothing less than to create a national park, in Argentina. Find out more in this article. Who is the Macb tobiano? 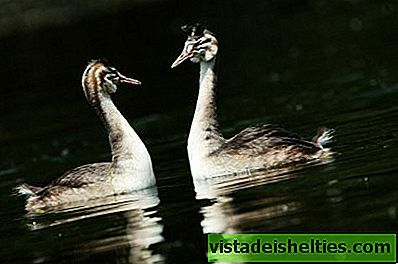 Its scientific name is Podiceps gallardoi, Y It is a small bird that lives in the Argentine Patagonia, specifically in the province of Santa Cruz. Looking like a duck, this bird was discovered in 1974, its feathers are black and white, it has black beak, brown head and a reddish circle around the eyes. It reproduces in lagoons of high plateaus, where it lives during the spring and the summer, between the months of September and March. There, the environment is cold and windy even in the 'good' months and the vegetation is scarce, typical of the Patagonian steppe. When the winter season arrives, the lagoons freeze and the Macb tobiano must emigrate. For years this small animal was investigated to determine where it was wintering. Finally, it was detected that it was traveling towards the estuaries and the Atlantic coast. Another characteristic that was known through the study of the species is that they fly at night, that they live in large groups, and that they swim and dive very well. The Macb tobiano performs a wonderful sexual courtship and, after finding a partner, builds a floating nest. The female lays two eggs, but only one of the chicks survives. 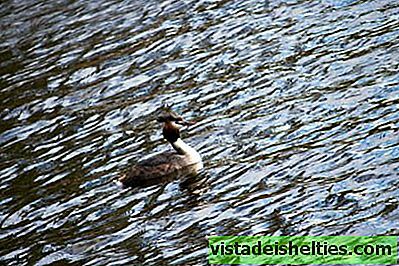 One of the main problems of the species is that seagulls, coots and mink – these last two introduced by man – feed on their eggs and hatchlings. Further, we can not leave aside the proliferation of rainbow trout, which eats the food of the macá tobiano. In addition, climate change increases the speed of the winds and causes great droughts, at the same time that it reduces the reproductive habitat of the bird. The population of this species has decreased by 80% in the last two decades and it is believed that there are currently about 800 specimens. To avoid extinction in the next few years, a project was carried out to create a national park to protect them. One of the symbols of Patagonian nature, as it is the Macb tobiano was the 'manager' of creating a reserve of more than 50 000 hectares -where the bird lives and reproduces- in the vicinity of the important lake Buenos Aires, in the middle of the steppe. Nowadays, a group of biologists are in charge of continuously monitoring the population of the species, conducting censuses, studying their migratory route, evaluating threats, to carry out direct action measures such as controlling the minks and gulls so that the eggs and chicks are not eaten and, of course, to make the communities of the area aware. The Patagonia National Park was founded in 2014 and the objective of the protectionists, in addition to saving that native 'duck', is to avoid the misuse of the great water reserve of the place: rivers, streams and springs that guarantee drinking water in a very broad region. Between these water mirrors, lagoons and wetlands stand out, where several migratory birds nest and feed and, of course, the Macá tobiano. Of course, it is not the only animal that is protected in this enclosure, since in the area also live some species of lizards, which have not yet been studied by scientists. The good news is that since the project began in 2009, and the national park was founded five years later, the number of macá tobiano specimens stabilized. There is still a long way to go, since The next step is to get the census to show positive results, that is, there are more individuals than the previous season. For now, this little bird, quite unknown and vulnerable, has become a symbol of the area and, of course, 'founder' of a national park.